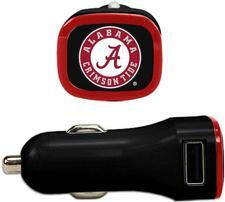 NCAA QuikVolt USB Car Charger-2 ports - $19.99 - GolfersEdgeOnline.com - Best Golf Equipment On The Web! Show the world which team you support and try the QuikVolt USB Car Charger. Go Team! If you have any more questions about the NCAA QuikVolt USB Car Charger-2 ports; do not see the model you are looking for; need custom options; or prefer to not purchase online, then please call us at (630) 656-1291.